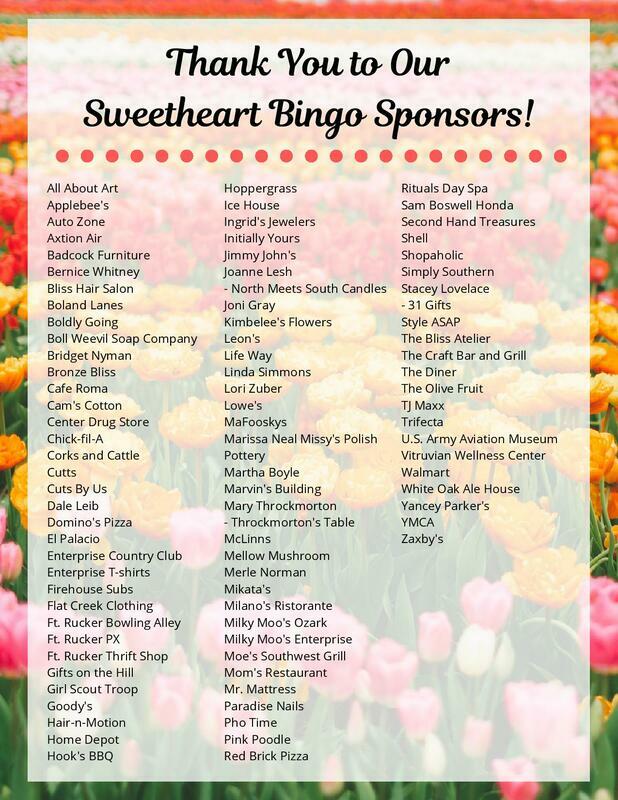 Click the link to read a great article about our community outreach program of Sweetheart Bingo. Welcome to Fort Rucker, Alabama, the home of the United States Army Aviation Center of Excellence. Incorporated in 1977, the Fort Rucker Community Spouses’ Club’s primary mission​ is to develop and foster a spirit of community responsibility, to provide welfare support for activities within the military community, and to provide opportunities for social, cultural, and creative pursuits. Our volunteers gladly give of their time and talents to serve both the military and civilian communities. ​ for military spouses and high school students. Joining the club is a wonderful way to meet new people and try things you may have never dreamed of doing. ©Fort Rucker Community Spouses' Club. All rights reserved. The Fort Rucker Community Spouses' Club is a 501(c)4 non-profit organization. This web site is solely for the purpose of distributing information and events to the FRCSC and Fort Rucker community. This site does not represent the view of the United States Army. ©Fort Rucker Community Spouses' Club. All rights reserved. The Fort Rucker Community Spouses' Club is a non-profit organization. This web site is solely for the purpose of distributing information and events to the FRCSC and Fort Rucker community. This site does not represent the view of the United States Army.